Mentha requienii the Corsican Mint. 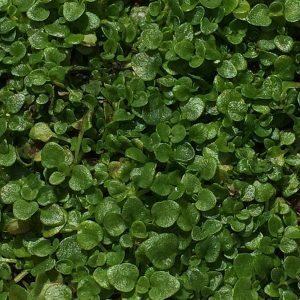 This is a fascinating ground hugging mint, Corsican Mint has tiny foliage and with a creeping habit it makes a good ground cover plant for damp shaded positions. It is an excellent plant for growing between pavers and will spread at a good rate. Although Corsican Mint does like moisture, it does not like waterlogged clay soils as this can cause root problems. For us it grows well on the shady side of a water tank, it receives good morning sun and afternoon shade. The deeper the shade the less water it will require. When crushed the foliage is very fragrant, a useful plant for a sensory garden. This is said to be an edible mint, however it is very strong tasting and rarely used in cooking. Once established it is very easy to grow, and in good conditions it will spread. Corsican Mint does have a strong fragrance and this can be considered when planting. One suggested use is for growing between pavers. This works well in areas of light foot traffic, the fragrance is released when the foliage is stepped on. Make sure the pavers are not concrete as this will leach lime into the soil and like most mints, Mentha requienii requires a slightly alkaline soil. You can also grow this plant in a container where it can be left to spread and flow down over the sides. Use it in the rock garden, or as a fragrant lawn alternative in low traffic areas. One of the more interesting uses is the foliage which is used in Creme de Menthe. Use it in containers in shaded positions as a ground cover, grow it the shaded rock garden, or use the leaves as a garnish, tea or in a salad. Corsican Mint only reaches around 3 -4 centimetres in height, it will flower in late summer with small lilac coloured flowers. Simply dig a section with a root system and replant. In overly wet conditions the root system may rot. This is not a mint that will tolerate very dry conditions. Not tolerant of heavy frosts. Soil – Well drained humus rich. Sandy oy clay soils will work as long as drainage is good. Spread – Will spread to form a good sized clump. Foliage – Small rounded deep green and fragrant.